Ah, the library at Twelve Oaks. A place for relaxation, passionate fights, and, just maybe, reading. 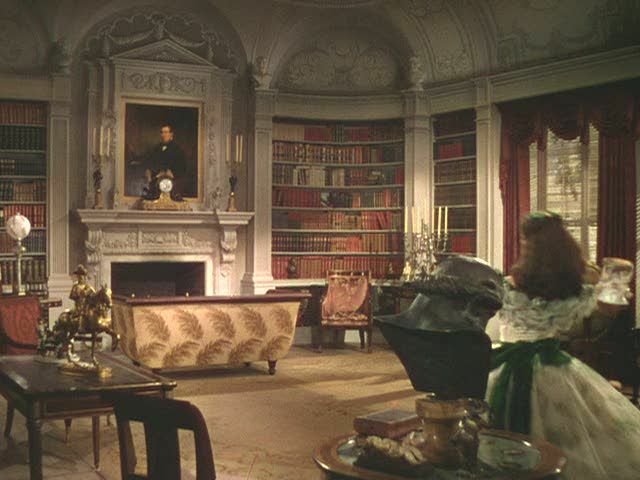 Elegant, but for me too formal to be enjoyed as a reader, more as an admirer of the architecture and decoration. Lovely library, though I find myself wanting to say “twiddle-de-dee”. Scarlett? Read a book? Maybe if she’d pulled a book off the shelf and went to curl up with it on the couch, the story would have turned out different. A bit stuffy, old bean, though I like the curved shelves in the corner.